Ever wondered what it’s like to be the person who lives in your SatNav? Well I found out during West Kent’s annual walk with the London Blind Ramblers on Sunday 30th July. We met at Borough Green station ("mind the gap") on a lovely sunny morning and it was evident we had another good turnout with 18 from WKWG and 15 from LBR. After introductions we paired up for the first leg of the 9 mile circular walk across rolling fields ("after 100 metres cowpat minefield approaching"), we needed the side stepping dexterity of Strictly dancers’ to negotiate that one! Orchards beckoned towards Ightham Mote. The beautiful apple orchards ("mind the overhanging trees") proved to be an enjoyable distraction as some foraged for decent windfalls ("apple hazard on footpath") and shared with our friends, of course! I helped to guide Jason, an IT teacher, as we chatted about our respective groups and shared interests in cricket and football. Rambling was his main escape from the constant misery of football as he is a Crystal Palace supporter. I then helped to guide his wife Jess ("after 50 metres uneven ground ahead") and learnt about their life together in south east London, their charity work and their recent trip to Italy with a company that specialises in holidays for the blind. We then enjoyed a picnic lunch at Ightham Mote, a 14th Century moated manor house, now a National Trust property. Other members took over guiding duties with most leading a partner for at least one leg of the walk. ("after 15 metres keep left stiles ahead"). Of course, we mustn't forget the wonderful dogs, both guide dogs and others who joined in the fun! Continuing along quiet country lanes ("ahead, narrow path, single file only") and more Kentish orchards before returning to Borough Green station ("you have reached your destination") to say our goodbyes and look forward to another walk next year. 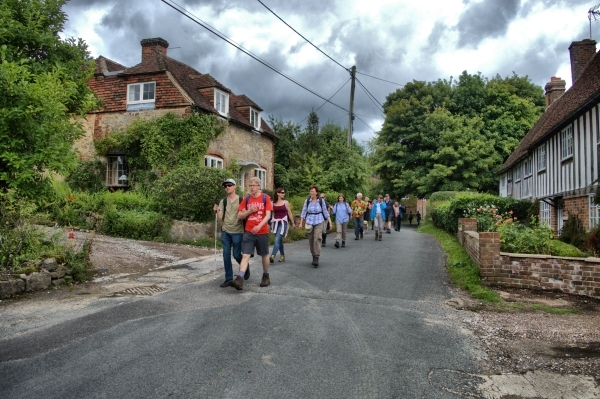 Thanks to Eva for arranging on behalf of West Kent Ramblers and to everyone who made this such a fun and rewarding day. 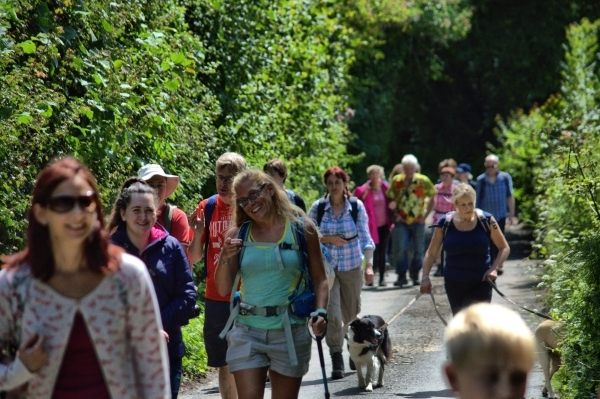 If your group would like to invite the London Blind Ramblers for a walk please email Valerie@clark.co.uk or visit http://www.metroblindsport.org/london-blind-rambling-club. They do 24 walks a year between March and October usually between 6-8 miles.